Some patients will experience post-operative back pain following lumbar discectomy, and the potential sources for that pain are poorly understood. One potential source is the vertebral endplates. The goal of this study was to document the changes that occur in lumbar endplates following discectomies, and to assess associations between endplate changes and clinical outcomes. 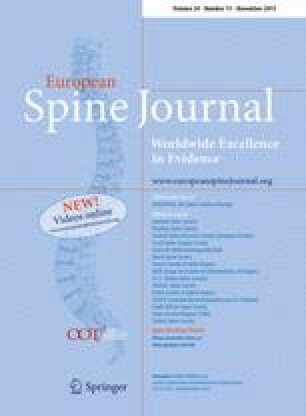 Changes in lumbar endplates and discs were assessed from X-rays, CT and MRI exams by comparing preoperative imaging with imaging obtained at yearly intervals up to 5 years. 260 endplates in 137 patients with single-level herniation and discectomy were analyzed. The geometry of osseous defects in the endplates was measured from the CT exams, and marrow and disc changes adjacent to endplates were assessed from the MRI exams. Clinical outcome assessments were collected at each time point. Descriptive statistics were used to describe endplate defect sizes, and logistic regression and analysis of variance were used to identify potential associations between endplate and vertebral body changes and clinical outcomes. Approximately 14 % of the endplates had osseous defects prior to surgery. After surgery, 24 % of inferior and 43 % of superior endplates had defects. Change occurred within the first year and remained relatively constant over the next few years. Disc signal intensity worsened and disc height decreased following surgery. New Modic changes were also observed. None of these changes were associated with having achieved a clinically significant improvement in outcome scores. The follow-up rates were low at the later time points and significant associations cannot be ruled out. This study documents lesion characteristics in detail and supports that osseous defects in the endplates at the level of a lumbar discectomy may be a relatively common finding following surgery, along with disc height loss, loss of disc signal intensity, and Modic changes. The clinical significance of these imaging findings could not be conclusively determined in this study. Patient follow-up and data analysis were supported by Intrinsic Therapeutics, Inc.